The groom dipped the bride under the market lights at this Villa Parker wedding reception. 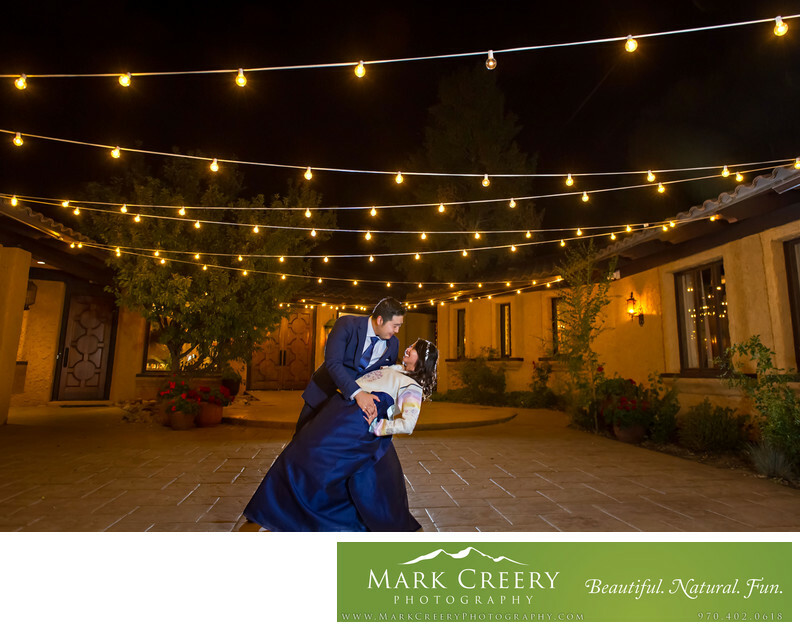 The bride was adamant about having this special lighting for her event, so it was paramount that we captured a beautiful night time portrait of them. I made sure to catch the glowing ambient light in the photo, so I chose a slower shutter speed to make this happen. I had an Ice Light (a hand-held constant light) that was just off camera to add some fill for the couple. As well, I positioned an off-camera flash directly behind them to create a rim light around them which allows them to separate from the background. The bride had three wedding dresses for her event! One was a fairy tale-inspired dress made in Hong Kong (where her mother lived). This one was very laborious to put on, but was gorgeous. The second was a traditional South Korean dress called a Hanbok, seen in this wedding reception photo. This is a colorful dress with intricate patterns. This represents the bride's heritage and was important for her to represent during the event. The third was a vintage dress she found in Seattle, which has a higher cut and was a lot more manageable to dance in. She also had three different shoes to go with them.